Bolton's Sam Ricketts has been ruled out for the rest of the season after rupturing his Achilles during the FA Cup fourth-round replay win at Wigan. The Wales international full-back is expected to be out for six months and is due to have an operation on Friday. 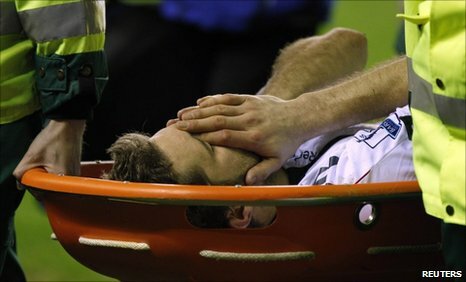 "The likelihood is he will be out for about six months which is a big blow for Sam," said Bolton boss Owen Coyle. Ricketts, 29, had to be carried off on a stretcher after going to ground in an attempt to close down Victor Moses. "He has been outstanding for us and our immediate thoughts go to him as we wish for a speedy recovery," added Coyle. "It was very innocuous as he sustained the injury by tracking the winger [Moses]. He has put his foot down and stumbled, so it is very unfortunate. "Sam will get all the help from the club that he requires, but we will now have to get on with everything." Coyle refused to blame the state of the Wigan's pitch which has now been re-laid after tearing up in recent weeks. The injury to Ricketts comes after centre-back Zat Knight suffered a knee injury in the win over Everton on Sunday, which is expected to keep him out for up to six weeks. Coyle said that Gretar Steinsson and Jlloyd Samuel are on their way back to fitness but will not be ready to play this weekend for the FA Cup tie against Fulham. The news will also be a blow to Wales boss Gary Speed as Ricketts was expected to be in the squad to face England on 26 March in the Euro 2012 qualifier in Cardiff.